The snow is falling and the holidays are upon us; creating the perfect storm for amazing powder days with friends and family, and more traffic than usual on the Sea to Sky Highway between Vancouver and Whistler. Let’s face it – in the winter the saying, “Nothing worthwhile comes easy,” carries a measure of significance. Here are some tips for a safer and more enjoyable journey up the Sea to Sky Highway. A hard and fast rule of the road first: you need winter tires to travel up the Sea to Sky Highway. 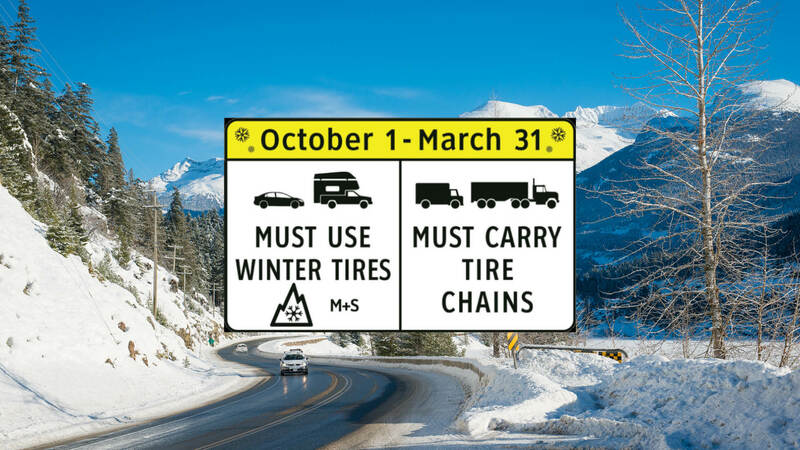 This law is in effect from October 1 to March 31 and requires all vehicles travelling up the highway to have winter tires marked with either a snowflake or a M+S symbol. They should also be in good condition with solid treads with at least 3.5mm depth. Sit back and enjoy the ride by carpooling, using a shuttle to get up to Whistler, or taking the local bus (here is Whistler Transit’s schedule). If you are coming to Whistler for a vacation you don’t necessarily need a vehicle; most accommodations are nestled at one of three base areas, and Whistler Village is pedestrian only. Why pay for parking all week when you can use a transfer to get up and down from the airport in comfort for less than the cost of a car rental, insurance and parking? If you live in the Lower Mainland, there are many options for shuttles that pick up at various locations and provide daily round-trip shuttles that get you to the mountain in comfort, many with WiFi connectivity. Bonus – many depart back to the city around 5 pm so you can enjoy a little cheeky après after your day on the mountain. There are peak times on the highway just as there on in any city during “rush hour”. When possible leave earlier or later in the morning or at the end of the day to avoid heavy traffic. Weekends are especially prone to traffic volume heading up and down the highway so consider planning your trip to the mountains on a weekday, if possible. Indulge during Whistler’s magic hour (the period right before sunset) by eating dinner in the village or soaking for a couple of hours at the Scandinave Spa Whistler. Staying a little later lets you avoid the heaviest traffic between 3-5 pm and make the most of your day trip to Whistler before getting back on the highway home. Staying overnight is another great option. With ski and stay packages, not to mention last minute hotel deals, a short and sweet getaway to Whistler lets you enjoy the entire day and night in Whistler before getting an early start home the next day. The day lots in Whistler tend to fill up fast, but Whistler Village does feature a large amount of underground parking including under the Whistler Conference Centre. Many major hotels have underground parking for a fee, make sure the lot has a pay machine for day parking and a visible sign for Advanced Pay Parking. These parking garages are heated and many are located within easy walking distance to the lifts. This may be a good option for carpoolers who can split the cost amongst themselves or for families who highly value the ease of getting ready in a warm and dry place, as well as the proximity to the mountain. 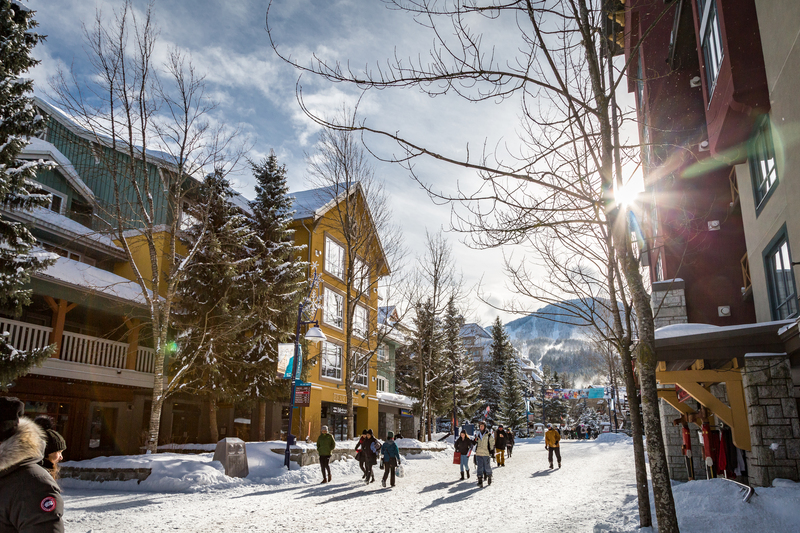 Learn more about all of Whistler’s parking options. Thanks to webcams up and down the highway, and mobile apps to keep you updated, you can get a good idea of what to expect on the road before you even back out of your driveway. Tune into Mountain FM (107.1 Squamish and 102.1 Whistler) for their consistent road updates all the way up the corridor and take it easy by keeping your speed down and not following other vehicles too closely. Also, be sure to note the variable speed limit on Highway 99 – the speed limit posted is enforced and is there to improve driver safety during unfavourable weather conditions. Events for Highway 99 – This link will notify you of any obstructions or delays that have been reported on the highway including areas with challenging driving conditions.